A fun worksheet for classrooms learning vegetable names, body parts, or possessives. Directions: Draw the designated vegetable to create the Vegetable Boy’s facial features. 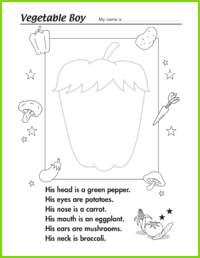 If there’s time, color in the picture and practice saying the body parts and vegetable names.